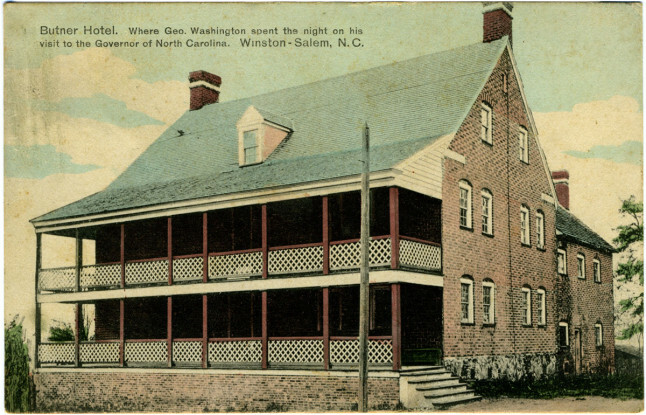 Salem Tavern, established in Salem in 1772 and today part of the Old Salem Historic District in Winston-Salem, likely offered the finest hospitality available in backcountry North Carolina for nearly a century. It provided fine accommodations, quality food, and honest dealings to both the ordinary traveler and the distinguished visitor, including George Washington, who visited the establishment in 1791. The tavern was an integral part of the town of Salem's plan and purpose. The Moravians who founded Salem intended the town to be a commercial center for the North Carolina backcountry, providing both a market for products of the interior and a place where necessary items of a high quality could be purchased by the area population. Those who came to Salem to trade frequently needed a place of refreshment. The tavern was, therefore, a primary point of contact between Moravians and the outside world. It was located on the southern periphery of the town so as not to interfere with the primary mission of a community in which evangelical religion was a central feature. The first tavern structure was half-timber, but it burned in 1784 in Salem's first major fire. It was rebuilt immediately, all brick construction, with an English architectural influence. Its two stories surmounted a full cellar whose vaulted ceilings were finished with plaster. The kitchen, with stone floors and massive cooking fireplaces, adjoined the rear of the building. Outbuildings, stables, gardens, and pasturage completed the complex. The interior of the tavern provided two levels of entertainment. One dining hall served meals at a common table at designated times, while a second room featured smaller tables and individual service. Upstairs, guests could sleep in small private rooms or opt for the less expensive alternative of renting a space in a bed. Extant inventories reveal furnishings of simple beauty and high utility. Salem Tavern served an important political purpose as well. On its spacious front porch, citizens listed their taxable property with the sheriff and paid their county levies. On election day, the tavern yard served as a polling place. From tavern walls echoed the political opinions of Patriots and Tories during the heated days of the American Revolution. Often words led to blows and rough-and-tumble fights, which raised Moravian fears of a disorderly establishment. For these reasons, the tavern was exclusively for the use and convenience of "strangers," that is, non-Moravians who were passing through. On several occasions, community leaders admonished the tavernkeeper that Salem citizens should not be served from the bar or be allowed to linger around the guests. The variety of events at Salem Tavern brought Salem Moravians in touch with the secular world and undoubtedly contributed to fundamental change in the town. But time itself created the greatest transformations, as Salem's first generation passed away and a new generation of town leaders emerged. By the 1840s, most of Salem's communal enterprises were in financial difficulty. Economic individualism increased in Salem, and gradually the community divested itself of unprofitable businesses. The gristmill, the tannery, the pottery, the store, and finally the tavern were sold to individual Moravians. When the new county of Forsyth was established in 1849 with its seat in Winston, immediately adjacent to Salem's northern border, the entire nature of the community shifted. The tavern was sold to Adam Butner in 1850. He soon recovered his investment and operated a profitable hostelry for several years. The old Salem Tavern building passed through a number of owners and finally ceased operating as a hotel about 1890. When the restoration of Old Salem began in the 1950s, the tavern building was given to the Wachovia Historical Society. They leased it to Old Salem, Inc., for careful, authentic restoration to its eighteenth-century character. It is currently open to visitors with guided tours. Hunter James, "A Tavern in the Town," Three Forks of Muddy Creek 4 (1977). "Salem Tavern Museum." Old Salem Museums and Gardens. http://www.oldsalem.org/salem-tavern-museum.html (accessed June 11, 2012). "Salem Tavern." National Historic Landmark summary listing. National Park Service, U.S. Department of the Interior. http://tps.cr.nps.gov/nhl/detail.cfm?ResourceId=431&ResourceType=Building (accessed June 12, 2012). Rettig, Polly M. and Sheehy, Horace J., Jr. "National Register of Historic Places Inventory - Nomination Form: Salem Tavern." National Park Service, U.S. Department of the Interior. June 05, 1975. http://pdfhost.focus.nps.gov/docs/NHLS/Text/66000592.pdf (accessed June 12, 2012). Snell, Charles W. "National Register of Historic Places - Property Photograph Form." National Park Service, U.S. Department of the Interior. March 20, 1969. http://pdfhost.focus.nps.gov/docs/NHLS/Photos/66000592.pdf (accessed June 12, 2012). "Butner Hotel. Where Geo. Washington spent the night on his visit to the Governor of North Carolina. Winston-Salem, N.C." in Durwood Barbour Collection of North Carolina Postcards (P077), North Carolina Collection Photographic Archives, Wilson Library, UNC-Chapel Hill. http://dc.lib.unc.edu/u?/nc_post,686.